‘All too often we complain about injustice and prejudice; we watch as the rights, history, and culture of others are trampled on or erased (take a look around, it’s happening now). Yet we say nothing and we do nothing. Sometimes, we refrain from speaking out because we assume that “speaking out” means protesting with signs or acts of civil disobedience. Speaking out can manifest in this way, but it can also happen through writing, through the way you live your life (being consistent in your values and actions), and by pointing out injustice in everyday situations when you see it. Writing about the civil-rights era, King said, “History will have to record that the greatest tragedy of this period of social transition was not the strident clamor of the bad people, but the appalling silence of the good people.” I can’t help but think that his words are applicable today in our current political climate—a climate in which civility has been replaced by anger, hate, and atrocious deeds. In order to change the tone of the rhetoric of hate, we must speak up. 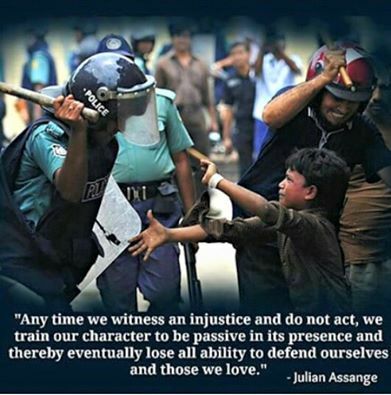 We must stand up against injustice and for those who are being treated unjustly. King urged us to feel passionate about freedom and justice, even calling upon us to give our life for what we believe in—much like he did. He said, “A man who won’t die for something is not fit to live.” Whether he met this in actuality does not matter to me. What he was saying is that when we feel strongly, we must act in the ways that we know how. We must use our strengths as individuals to make society better and we must act as the conscience of our nation. It’s the God in WE! Is It Really That Farfetched?